There is much distress, fury, and plummeting morale among police officers in the New York Police Department – and they have every reason to be outraged. 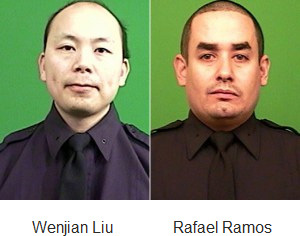 Two NYPD officers, Wenjian Liu, 32, and Rafael Ramos, 40, were murdered at about 3 p.m. Saturday, December 20, 2014 while sitting in their marked car in the Bedford-Stuyvesant section of Brooklyn. Their deaths came after months of propaganda about how the police are the enemy of the black community, former New York Mayor, Rudy Giuliani, said on Fox and Friends. Not only in the NYPD, but throughout the country, a malaise has set in as race baiters Al (not so) Sharpton, as conservative talk show host Mark Levin appropriately calls him, Louis Farrakhan and others spew their lies and hatred at the police. "Here's what race baiting leads to. The blood of these police officers is on the hands of Bill de Blasio. It's on the hands of Obama. It's on Al Sharpton's hands (but his hands are covered in blood from Crown Heights and Freddy's) and they're on the hands of a media that helped whip up the racist rants." Former Mayor Giuliani, speaking on Fox and Friends said, "There is no question from the words of killer, Ismaaiyl Brinsley, that the killings were connected to the deaths of Eric Garner in New York and Michael Brown in Missouri." Brinsley had posted messages on Instagram saying he was going to kill police officers. Brinsley also had wounded his girlfriend in a shooting in Baltimore before driving to New York and ambushing the officers. "... it's certainly true," said Giuliani, "that we have been treated to about three to four months of propaganda about how the police are the enemy. About how the police are the problem. About how they are the major problem between the police and the black community." Ismaaiyl Abdullah Brinsley announced on Instagram, "They Take 1 Of Ours ... Let's Take 2 of Theirs." 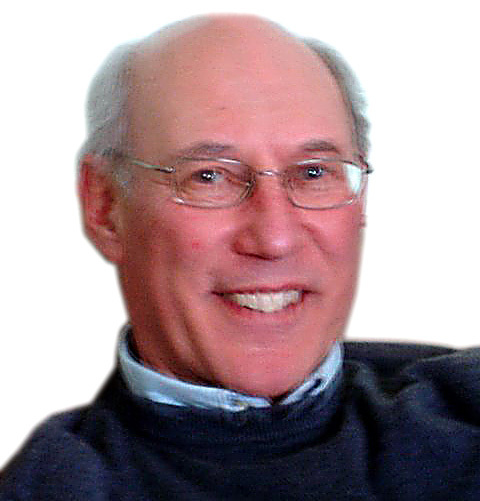 According to Daniel Greenfield, "He apparently spoke Arabic and his Facebook page from March 17 included verses from the Koran." "Against them make ready your strength to the utmost of your power, including steeds of war, to strike terror into (the hearts of) the enemies of Allah and your enemies, and others besides, whom ye may not know, but whom Allah doth know. Whatever ye shall spend in the cause of Allah, shall be repaid unto you, and ye shall not be treated unjustly." 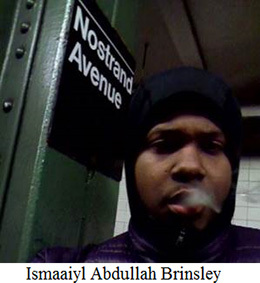 According to the Daily News, Brinsley, 28, who had addresses in Georgia, Maryland and Brooklyn reportedly belonged to a gang and later killed himself on a crowded Brooklyn subway platform as police closed in on him. He bragged on his Instagram page just hours before that he wanted to kill police officers. Brinsley was black; the slain officers were Asian and Hispanic. He murdered the two police officers, firing four shots into them as they sat in their patrol car during a break. Moments before opening fire, Ismaaiyl Brinsley, approached people on the street and asked them to follow him on Instagram, then told them, "Watch what I'm going to do," Chief of Detectives Robert Boyce said. "No warning, no provocation – they were quite simply assassinated, targeted for their uniform," Police Commissioner William Bratton said of the two police officers. He confirmed that Brinsley was already a fugitive, suspected of putting a bullet in his ex-girlfriend's abdomen at her residence in Baltimore earlier on that fateful Saturday. Associated Press (AP) reported that Ismaaiyl Brinsley had at least 19 arrests in Georgia and Ohio, spent two years in prison for gun possession and had a troubled childhood so violent that his mother was afraid of him, police said. Former New York City Police Commissioner, Bernard Kerik, told Newsmax that the execution-style shooting of two uniformed police officers was ultimately encouraged by Mayor Bill de Blasio and the Rev. Al Sharpton and "they have blood on their hands." "This guy's intent – based on that Instagram post – was retribution for Eric Garner and Michael Brown. The people who encouraged these protests – you had peaceful protesters who were screaming 'kill the cops' – the so-called peaceful protesters. "Who was encouraging these protesters? De Blasio, Sharpton, and other elected officials and community leaders. They encouraged this mentality. They encouraged this behavior. "They encouraged it – and these two cops are dead because of people like them. They don't owe the cops an apology. An apology isn't good enough. They have blood on their hands." Later, Bernard Kerik called for peaceful citizen demonstrations over the deaths of the officers. The killing of the two young policemen sitting quietly in their car in New York City will be justified by the haters with the lie that they – the police victims – were somehow responsible for the deaths of Michael Brown and Eric Garner. Also the inevitable plea will surface that the killer's excuse was that he suffered a troubled childhood. There is a global tsunami of lies and hatred being spewed across America and the globe, but it is futile to look to the Oval Office or to Attorney General Eric Holder's (in)Justice Department to lead the way to reinstituting civilization based on truth and love. There seems no way out of the bonfire of rage the world has become today because it is tragically the very inhabitant of the Oval Office himself who has brought prevarication and deception in both our domestic and foreign policy to the deplorable depths we now endure. Our hearts go out to the police, men and women, whose lives have been threatened by such an ugly campaign of vilification and demonization.